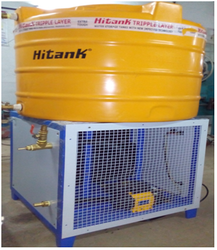 With our immense domain expertise, we are involved in offering Water Circulator. Ideal for chilling and condensing operations for rotary vacuum evaporator, viscosity tests, spectrophotometry, water baths, this circulator is manufactured using the best quality components and cutting edge technology in line with industry norms. Apart from this, we provide this circulator in different sizes and designs as per the needs of our clients. Our quality examiners test this circulator against varied quality examiners. Looking for Water Circulator ?